Starting in 1965, the Israeli Air Force had made it their habit to begin each day with massive training flights involving hundreds of aircraft flying over the Mediterranean Sea. As the months went by and the pattern continued every day, Egyptian radar operators and their superiors became accustomed to the daily flight. Meanwhile, the Israelis studied Egyptian patrol patterns, and found that the squadrons all landed at the same time each morning so that air crews could be served breakfast together in their mess halls. On the morning of 5 June 1967, the Israeli planes turned south instead of heading home, striking Egyptian airfields in the Sinai, Suez Canal area and Nile Delta beginning at 0746. The Israelis pounded the bases for three hours, destroying over 300 Egyptian planes and killing over 100 irreplaceable pilots. Few Egyptian fighters rose to meet them, and fewer still escaped to the bases in western and southern Egypt left untouched by the Israeli attacks. Learning that the Egyptians had tried to hide their fighters underneath the wings of passenger planes at Cairo International Airport, the Israelis returned in the afternoon and blasted the airliners and the jets hiding beneath them. At 0815, Gen. Yehushua Gavish of Israel’s Southern Command ordered his tanks and infantry forward. The Israeli attack began with Gen. Israel Tal’s ugda – a division-sized task force – striking at Rafah near the northern coast of Sinai and the southwestern edge of the Gaza Strip with the IDF’s finest unit, the 7th Armored Brigade, as its spearhead. The Egyptian 7th Infantry Division, considered a mediocre unit by both the Egyptian Army and its Soviet advisors, fought back from the fortifications with grim determination, shocking both the Israelis and their own command staff. The Egyptians neither ran nor surrendered, fighting until killed or wounded, but when the Israeli tanks forced their way past the Egyptians did not even fire at their rear flank. Note: Sword of Israel Scenario 1 is based on this battle. Egyptian artillery likewise rained down effective fire on the Israelis as they advanced into the zones registered before the war. But once the Israelis had left those areas, the Egyptian gunners had neither the training nor the initiative to shift their targets to keep up with the enemy advance – despite possession of excellent modern 122mm and 130mm pieces of enormous range and accuracy. Egyptian defense plans also depended on counter-attacks, and in this sector the Egyptians made only one serious attempt, a mad change by a battalion of T-55 tanks that ended in disaster. Note: Sword of Israel Scenarios 3, 4 and 5 are based on this battle. Pushing past the Egyptian lines, the 7th Armored Brigade drove toward its next objective, Jiradi Pass and the road to El Arish. Here the Egyptian 6th Infantry Brigade held the pass along with two supporting tank battalions, but they allowed the first Israeli tank battalion to drive through the pass with almost no shots fired. In what would become a pattern for Egyptian senior command staffs, 7th Infantry Division had not informed any other headquarters of the Israeli breakthrough, pretending that all was well on its front. After the first Israeli battalion went by, the Egyptians in Jiradi Pass put up stout resistance to the second. Unable to use their advantages in maneuver, the Israelis had to come head-on against dug-in Egyptian tanks and infantry and suffered heavy losses in fierce fighting that lasted into the night. The Israelis finally worked their way around the Egyptian positions. Outflanked, the Egyptians failed to counter-attack but fought to the death to hold their positions, and Tal had to commit his reserve, a crack brigade of paratroopers, who helped the armor and mechanized infantry clear the pass in hours of bitter hand-to-hand fighting. Note: Sword of Israel Scenario 6 is based on this battle. To the south of Rafah, the 2nd Infantry Division – considered one of the Egyptian National Army’s best units – held the vital crossroads of Abu Agheila, the “gateway to Sinai.” The Egyptians had fought off Israeli attacks here in 1956, and in the years since had deepened and expanded their fortifications. Unfortunately for the Arab cause, they had done so very poorly. The Israelis had been unable to move through the sand dunes north of Abu Agheila in 1956, and the Egyptians assumed this would be true in 1967 as well and did nothing to extend their position to cover an advance through the dunes. Instead they prepared against a frontal assault, with three lines of concrete bunkers connected by trenches and supported by dug-in tanks. Copious artillery support backed the defenders, with pre-registered fire zones. More tanks and tank destroyers waited in reserve to counter-attack any breakthroughs. 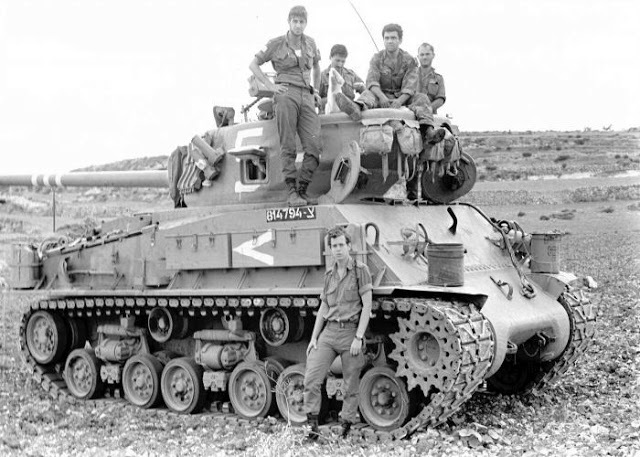 The IDF's secret weapon: the M51 Super Sherman with a French-made 105mm gun. Ariel Sharon, commanding the udga tasked with capturing Abu Aghelia, first tried to take the position with a swift frontal assault taking advantage of surprised. The Egyptians were ready, and fought off the initial Israeli attack and another delivered at 1230 hours. Showing their tactical flexibility, the Israelis promptly switched to the more complex alternative plan worked out during the years before the war. Sharon sent a tank battalion on a wide swing through the dunes to the north of the Egyptian positions, and landed a battalion of paratroopers behind Egyptian lines using six helicopters in relays to ferry them into position. Sharon gathered 96 artillery pieces for the heaviest Israeli bombardment of the campaign, and launched what seemed to be another frontal assault by a tank brigade at 2230 hours. 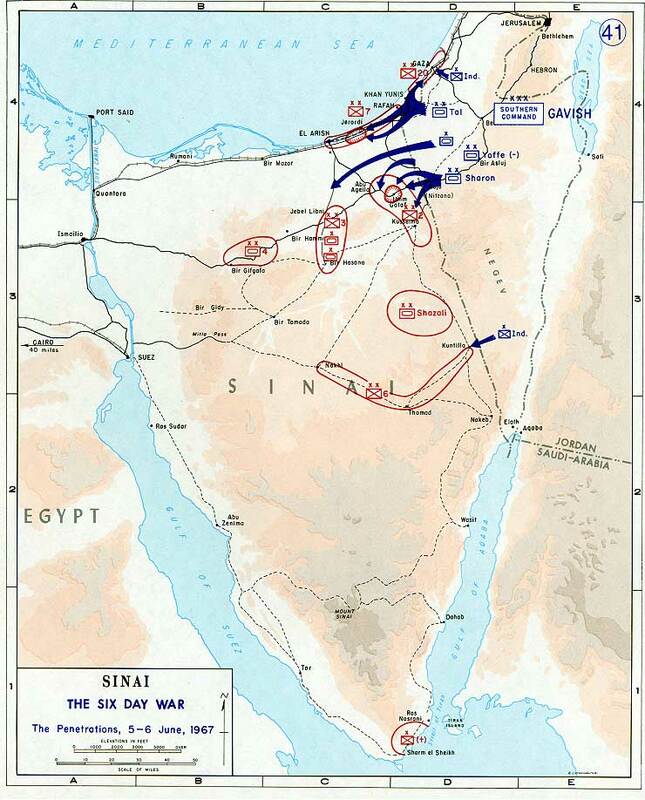 But this time, while the Egyptians faced the enemies in front of them, Sharon’s infantry brigade marched through the dunes and attacked the northern end of their line. Meanwhile, the paratroopers burst out of their hiding places and overran the Egyptian artillery, while the Centurion tanks sent through the dunes erupted into the Egyptian rear area and attacked their armored reserve before it could move forward to assist the troops at the front. The Egyptians fought fanatically to hold their positions, but did nothing to re-orient those positions to meet the changed threat. The Israeli infantry rolled up their lines, despite fierce hand-to-hand fighting. The Egyptians tried to call in artillery fire on their own positions, but the Egyptian artillery had been put out of action by Sharon’s paratroopers. The Egyptian tankers, their T-34/85’s badly out-classed by the Israeli Centurions, fought their tanks until they were destroyed, but in almost every case did so by remaining in place and firing from there at the Israelis. Note: Sword of Israel Scenarios 8 and 11 through 13 are based on this battle. The third Israeli ugda, led by Gen. Avraham Yoffe, advanced between the two other ugdot into a region of sand dunes declared impassable by the Egyptians and therefore left essentially undefended. The Israelis had prepared for this through exercises in their own Negev Desert, and lighter vehicles able to traverse the sand went first. Behind them they spooled out rolls of chicken wire to assist the heavier tanks in crossing the sand. Yoffe’s spearheads made rapid progress against only light opposition. Note: Sword of Israel Scenario 7 is based on this battle. Gavish had planned to simply contain and bypass the Egyptian division in the Gaza Strip. 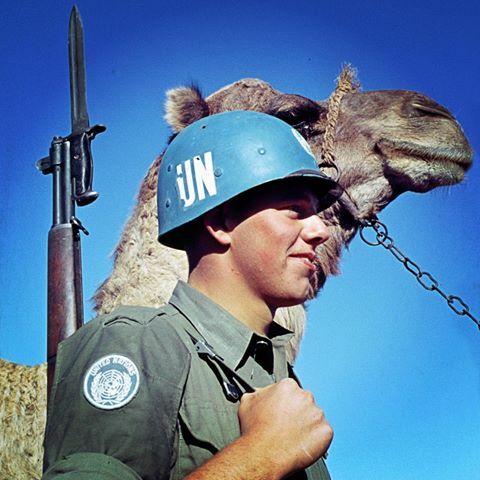 Egyptian President Gamel abdel Nasser had ordered United Nations observers out of the Sinai, but not Gaza, and the Israeli government did not want to create an international incident by harming or killing U.N. soldiers. But when the Egyptian garrison and some Palestinian militants began to fire on nearby Israeli communities, chief of staff Yitzhak Rabin overrode Gavish and ordered the 11th Mechanized Brigade to clear Gaza. By nightfall the Israelis had taken the hills overlooking Gaza City, but the Egyptian-Palestinian forces held onto the city itself. Note: Sword of Israel Scenario 2 is based on this battle. The Egyptian National Army’s 20th “Palestinian” Infantry Division held the Strip. Though sometimes called a Palestine Liberation Army unit, the 20th Infantry Division was trained and officered by the Egyptians and part of the regular army; none of the Arab regimes allowed the Palestinians to control their own military units until after the shock of the Six-Day War. The personnel were overwhelmingly Palestinian, however, and were not willing to refrain from firing at the hated Israelis. On the southern end of the front, the Egyptian high command had expected great things from its well-equipped 6th Mechanized Division. The Egyptians expected a major Israeli effort at Kuntilla, where a defensive complex barred the road leading across Sinai to the strategic Mitla Pass. Col. Albert Mandler’s 8th Armored Brigade was to make a diversionary attack here, but Mandler sent his troops forward and they took the fortifications amid intense fighting. Once again, the Egyptians resisted fiercely within their own positions, but did nothing to reinforce them, counter-attack or re-oritent themselves to meet the Israeli onslaught. The defeat of 6th Mechanized Division would have even deeper repercussions than those suffered by the other two front-line Egyptian divisions. Like 7th Infantry Division, the headquarters of 6th Mechanized did not admit the scope of its defeat. Field Marshal Abdel Hakim Amer, the Egyptian commander-in-chief, further inflated that lack of defeat into outright victory, and informed the Jordanians that 6th Mechanized Division had beaten the Israelis in front of them and was advancing into Israeli territory, a claim also broadcast by Cairo’s semi-official Voice of the Arabs radio station. Amer ordered the Eastern Front commander, Abdul Munim Riyad, to send a Jordanian armored brigade into the Negev to link up with this non-existent Egyptian advance, a move that would unravel Jordan’s defenses and lead to disaster on the West Bank. 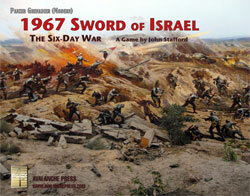 Don’t wait to put 1967: Sword of Israel on your game table! Join the Gold Club and find out how to get it before anyone else!